I am standing in an immense, high-ceilinged wood and thatch building. There are no walls, so a slight breeze provides some respite from the heat, while Mr Viphat’s gravelly voice is recounting a story. It is said that, long ago, a great flood covered the world, leaving two survivors – a woman, Anoi Amek, and a dog, Apuu Paner. The dog wished to marry the woman, but she refused. She would only marry the dog if he fetched fire from the mountaintop. On the first two attempts, the streams he crossed extinguished the fire upon his return. On the third attempt, he succeeded by placing the fire in a gourd tied around his neck, and Anoi Amek and Apuu Paner united. Their human offspring married, and their children are the Katu people. Mr Viphat is the village chief of Ban Kandone, an ethnic Katu village in Sekong Province in southern Laos. 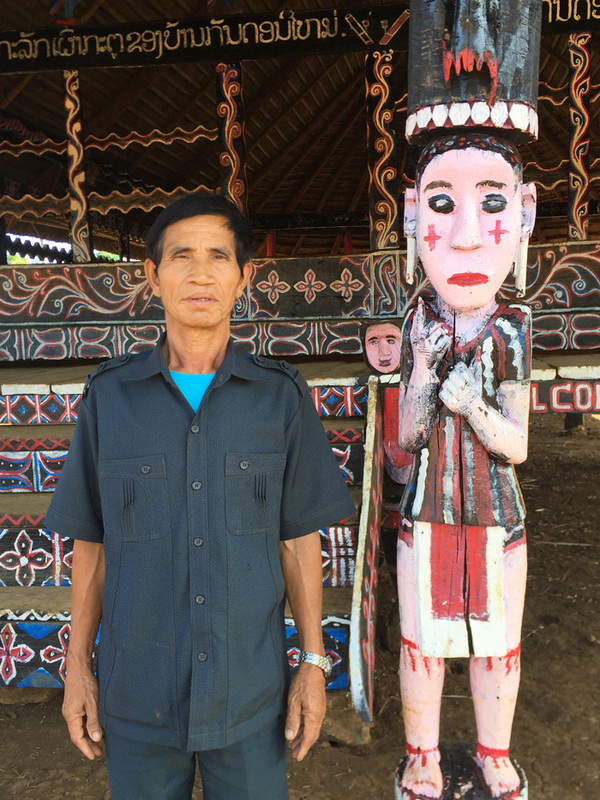 He is also the community’s unofficial historian, tourist guide, and culture keeper. The Katu are traditionally swidden cultivators and skilled hunters living in the Annam Mountains in southern Laos and central Vietnam (the Central Annamite Mountain region). The total population, which amounts to approximately 300,000 peoples, is roughly evenly divided between the two countries. 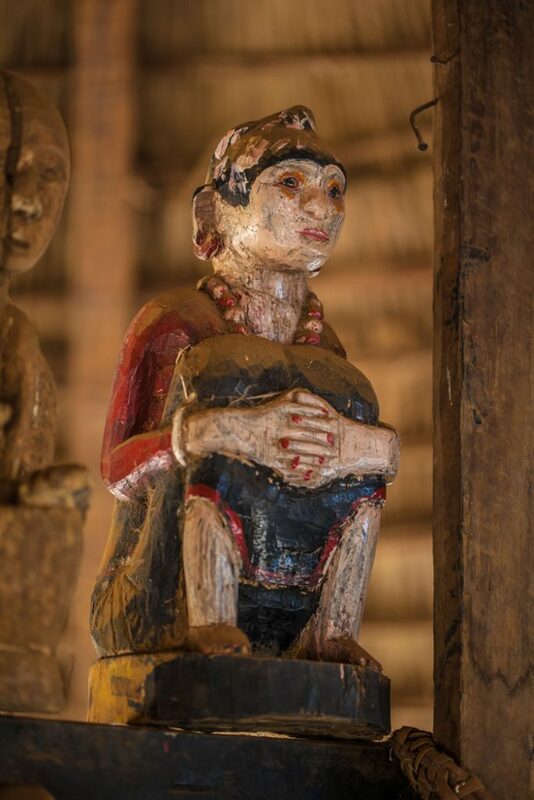 The story of Anoi Amek and Apuu Paner is the Katu people’s origin myth, and we’re looking at painted statues of the two central characters placed on a cross-beam of the building. We are in Kandone’s communal house, called the rong, which is both the physical and spiritual centre of the community. 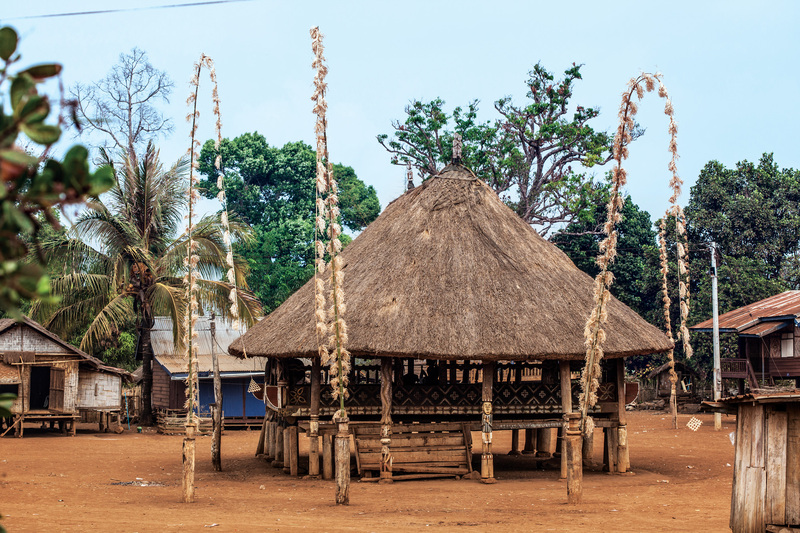 The homes of the residents form a wide circle around the rong, facing it, and village meetings, festivals, and feasts all take place in and around the building. It is decorated with carvings of animals and humans and nature motifs, representing beings from their environment, myths, and ancestors. Huge snakes extend across joists, and turtles, birds and lizards perch under the eaves. In one corner, a dozen buffalo skulls with their curved horns are hung on top of each other. Mr Viphat explains that these are from their annual buffalo sacrifice, the largest and most important ceremony of the year. He points to three wooden poles in front of the rong. Mr Viphat shows me around Kandone, which is a government-designated tourism and cultural village in Sekong Province, though it does not currently receive many visitors, being somewhat off the beaten track. It’s about 21km from the popular Bolaven Plateau loop and its coffee plantations, and about two hours from Pakse town. 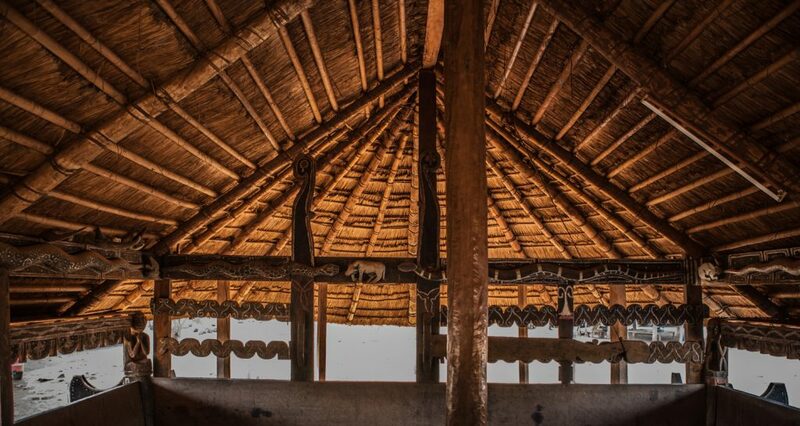 The village’s striking communal house is the main draw, but the clean and friendly community also boasts homestays, a waterfall, and one remaining traditional coffin. This may seem like an unusual “sight”, but Mr Viphat points it out with pride. Carved out of one solid piece of wood, the tubular coffin is decorated with sculpted serpent heads and curlicues and is stored under a rice granary. Its owner, now in his 80’s, made it over 10 years ago in preparation for his death. These days, Katu tend to be buried in more traditional plywood box coffins, or those made of concrete. It’s now difficult to find trees of the size needed or people with the time and skills to craft the coffins. “Where will he be buried?” I ask. Mr Viphat indicates an area beyond the edge of the settlement. Their cemetery is a collection of tomb houses – a village of the dead – where the ancestor spirits live. The village of the living and the village of the dead are each other’s mirror image and complement: the living need the ancestors for protection and the ancestor spirits depend on their living descendants for care and attention in the form of ritual food offerings. Kandone is also home to many skilled weavers. The Katu weave on backstrap looms, an ancient technique of creating cloth. Different from the frame looms used by the Tai groups, such as the Lao and Tai Daeng people, the women sit on the floor and use the extension of their legs and their weight to extend the warp threads. Katu backstrap loom weaving is also distinctive for using weft-based beading, creating graphic designs which require a great deal of patience and skill. Traditional textiles would be red, black, and white, with lead or aluminium beads. Today, textiles come in a rainbow of colours with the availability of pre-dyed yarns from the market, and are accented with plastic beads. As we walk down the main thoroughfare of the village I see that several houses have textiles for sale, simply hung on wires strung between supporting pillars. Their owners look at me hopefully as I browse. Mr Viphat shows me a small half-constructed house towards the entrance of the community. He’s trying to build a handicraft shop, where everyone can leave their products to sell. “At the moment, tourists have to go house-to-house to buy. If you’re not home that day, you have lost your chance to sell your textiles.” He doesn’t lack entrepreneurial spirit – he explains he’ll charge each artisan a percentage when their craft is sold, an opportunity for both him and the sellers. He hopes more tourists will visit and the community will gain a source of supplementary income. Our tour of the village ends back in the rong. School is out, and the children have come to gaze at the foreign visitor. They chase each other across the wide building, bare feet pounding the smooth floorboards, and hide behind poles carved with monkeys and humans. They scamper up and down the precarious narrow stairs, and shout to each other in Katu. Their comfort and familiarity here in the heart of their community is clear. Kandone doesn’t need tourists or a government title to keep their culture intact. To learn more about the ethnic groups of Laos, visit the Traditional Arts and Ethnology Centre in Luang Prabang.